When the temperature rises in the summer I like to eat light and have lots of homemade snacks. I posted my healthy peanut butter beauty bars right before they went in the oven on my FaceBook fan page and lots of your girls emailed or commented on wanting the recipe, here it is. Enjoy!!!! 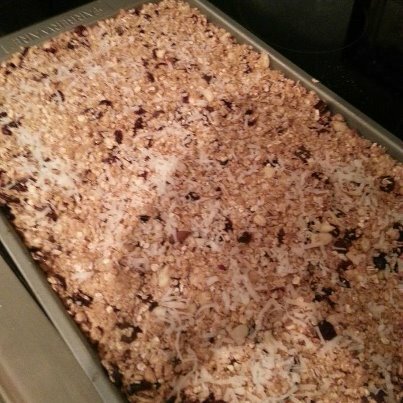 Shredded Sweet Coconut (I added this just on the top before I put in the oven. 1. Pre-heat oven to 350 and spray 13″x9″ baking pan with a non stick cooking spray. In a large bowl, combine oats and peanuts. Add the honey and mix to combine. Add melted peanut butter and mix until moistened. You can throw in your add-ins at this time. Fold them into the dough. I got my hands in there to really get incorporate all the delish ingredients. If you dough is too dry add in more peanut butter or honey 1 tablespoon at a time until moistened. Press dough on a greased 9 x 13 baking pan. Bake for 25 minutes. If you would like to try the no bake option just press the dough into the pan and refrigerate for 60 minutes. Voila you have a fabulous healthy snack for on the go this hot summer.